My bathroom sinks burbled and sprayed. It's bothered me ever since I moved in, but I've been busy fixing other things (carpets vacuum shampooed? yup). Inspired by Jeroen De Wilde's roaster, I decided the time had come to tackle this. Little did I know that it would lead me down a rabbit hole of alternatives analysis, proprietary design, and vendor lock-in. The story unfolds below. 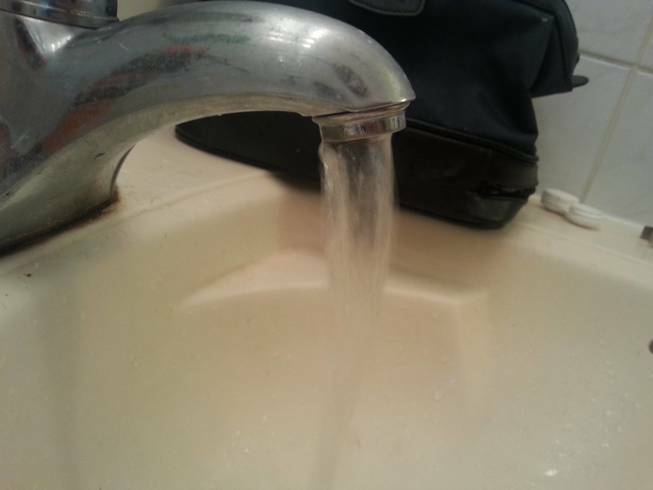 This sink burbles and sprays. It gets water everywhere, lacks aesthetics, wastes water, and seems unhygienic (I don't know why I feel this way about the latter bit). BUT IT IS TOTALLY FIXABLE! 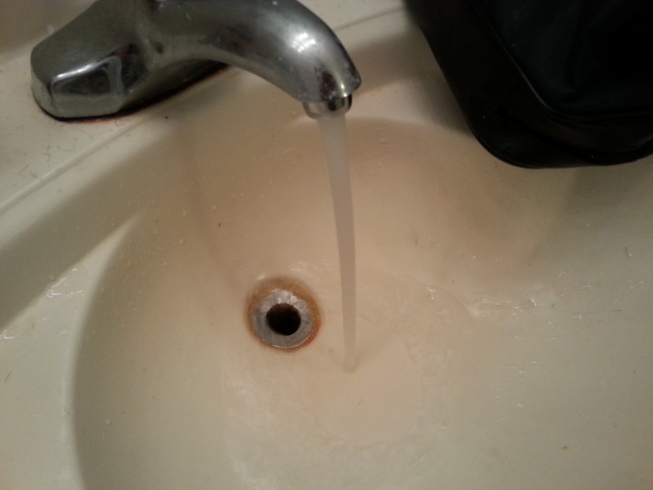 A little genlte work with the vise-grip wrench to the aerator off and showed that, indeed, the sink had good flow. That isolated the issue. 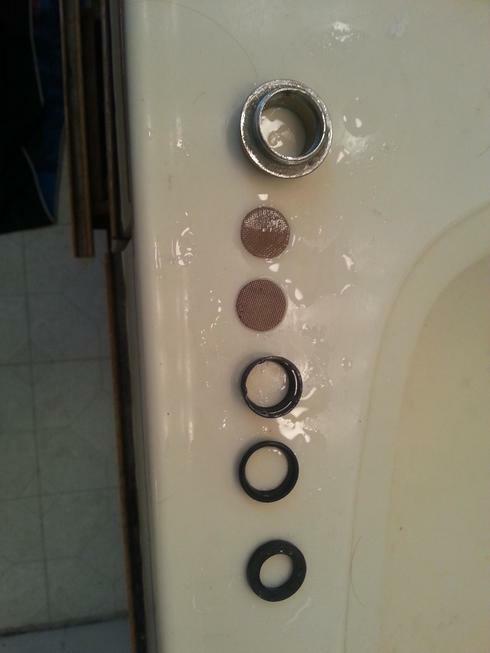 Speaking of the aerator… here are the parts I got out of it. A double-stacked screen, a basket for the screen, a top for the basket, and a rubber O-ring. 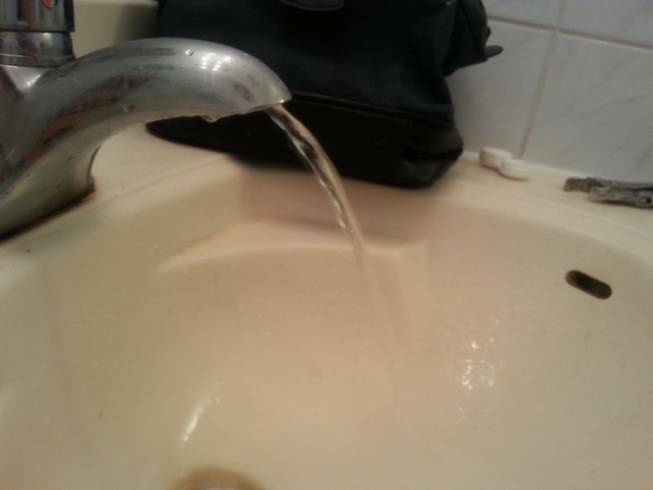 The second sink was missing the O-ring… someone opened these sinks before and didn't appropriately reassemble them. Sadly not photographed were the little rocks and hard gunk on the screens. If this aerator weren't missing parts (see the next photo), cleaning that gunk off probably would have fixed the issue and I'd have been done. A picture of some new gunk I found is shown below: the old stuff was harder and larger. 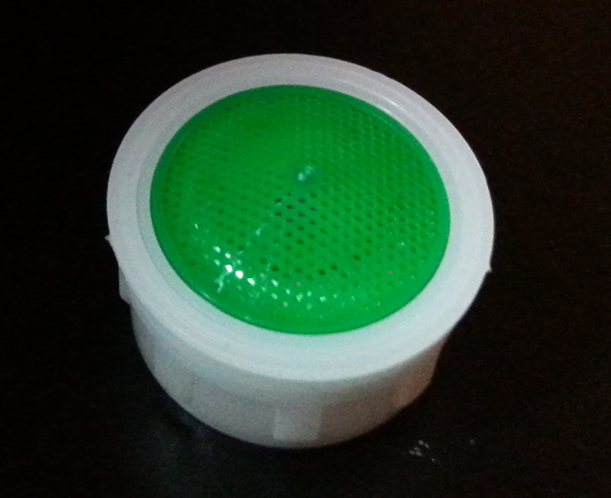 So, my old aerator was missing parts: the restrictor and mixer were just… gone. It's easy to imagine losing an O-ring down the drain accidentally, but hard to imagine how the last fixer-upper lost these pieces. 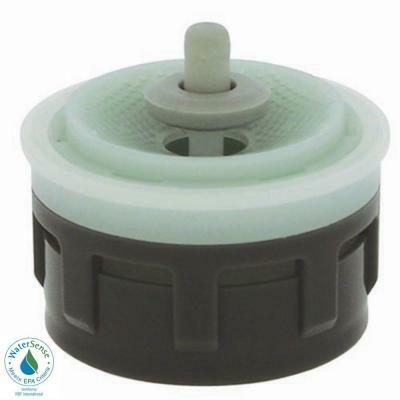 Replacement Candidate #1: Plumb Park's Auto-Cleaning Aerator. The Ace Hardware person recommended this because its metal casing would "fit". Turns out: lots of metal casings fit and the hardware store has a handy thing you can screw your old aerator into so you get the sizing right. This aerator was a clear reject. The idea (see next picture) is to do a first flush to get debris off the top screen, then close the gap with the washer to initiate aeration. The problem? That's a big hole on the top and the screen at the bottom is fine mesh: this thing's going to get loaded with junk, I won't be able to clean it, and I'll have to buy a new one within (possibly) weeks. That's a no go. An example of epic over-engineering failing. This design would have a certain charm… if the holes at the bottom were big enough to let gunk out. 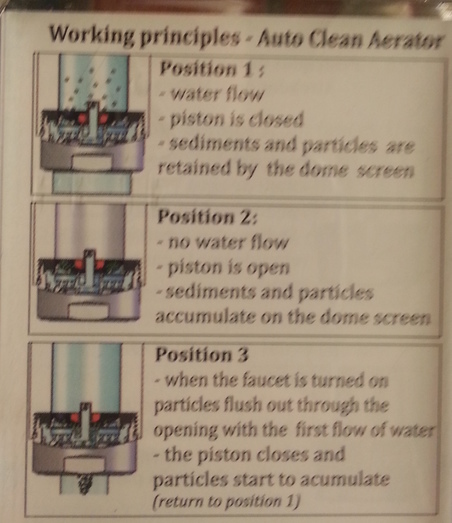 But they're not, so this aerator, far from being self-cleaning is more like self-filthing. Replacement Candidate #2: The "Cyclone" Aerator. 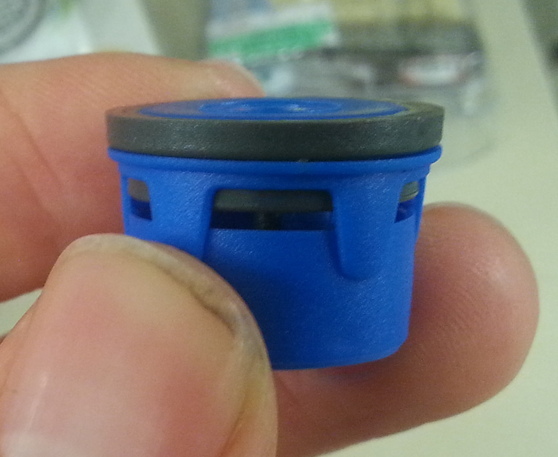 Barely visible on the top of this aerator (sorry for the bad angle) is a big hole. Naturally, the bottom is a fine, inaccessible mesh. This is another aerator asking to get clogged. 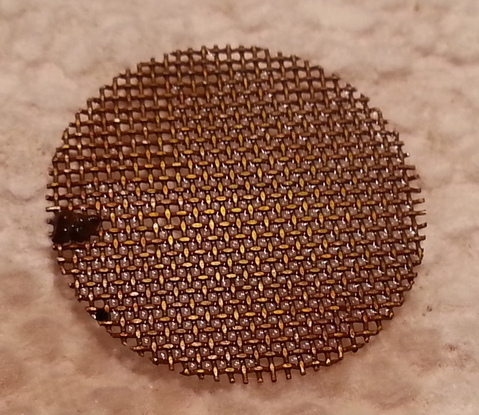 And here it is: fine mesh on the top to keep that big crud from getting in. Fine mesh on the bottom to help break up the flow. It's not self-cleaning, but I know how to use a wrench, so who cares? But this is where things took a turn for the sad. Turns out all of the aerators I just showed you are sized to within millimetres of each other. But different millimetres, such that none of them are interchangeable in the metal casings of the other vendors. 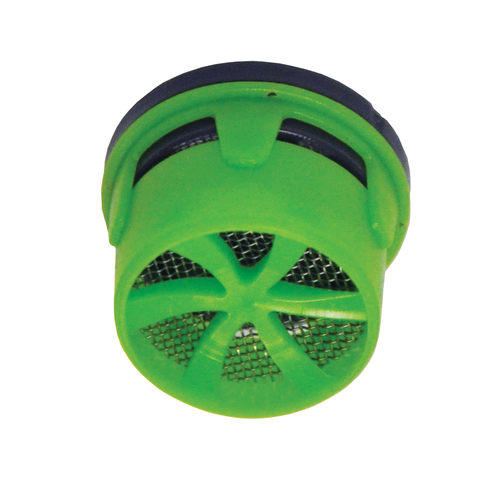 So, instead of picking up two $3 aerators, I need two $7 aerator+casings… or I can buy six of them in bulk for $16. But the flow's fixed, so that's okay.